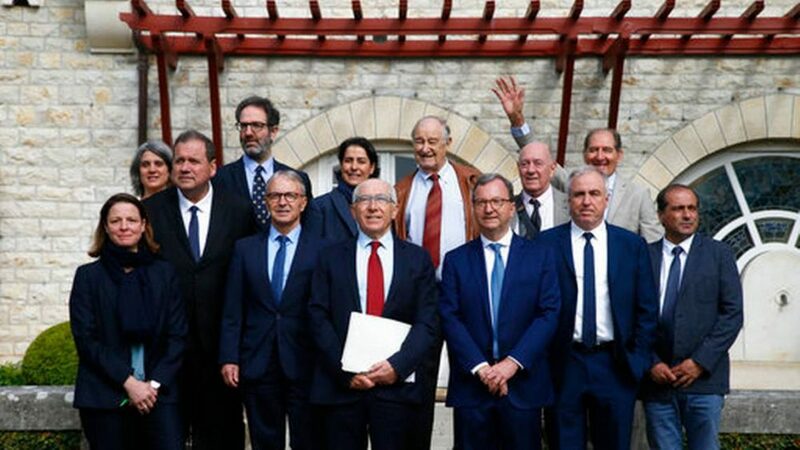 South African lawyer Brian Currin, second row right, raises his arm, with Raymond Kendall, center behind, Alberto Spectorovsky, second right behind, Agus Hernan, right, Bayonne mayor Jean-René Etchegaray, center, and other officials and pose during an international conference that will mark the permanent end of the ETA, Friday, May 4, 2018 in Cambo-les-Bains, southwestern France. International mediators hailed the disbanding of Basque separatist group ETA as a turning point for Europe after decades of bombings and shootings — but Spain’s prime minister remained unforgiving of a group that killed 850 people in its drive for a Basque homeland. “Work remains to be done on all sides …. Peace is not a zero-sum game but a matter of political consent where both sides agree to pursue their aims peacefully and democratically,” they said.